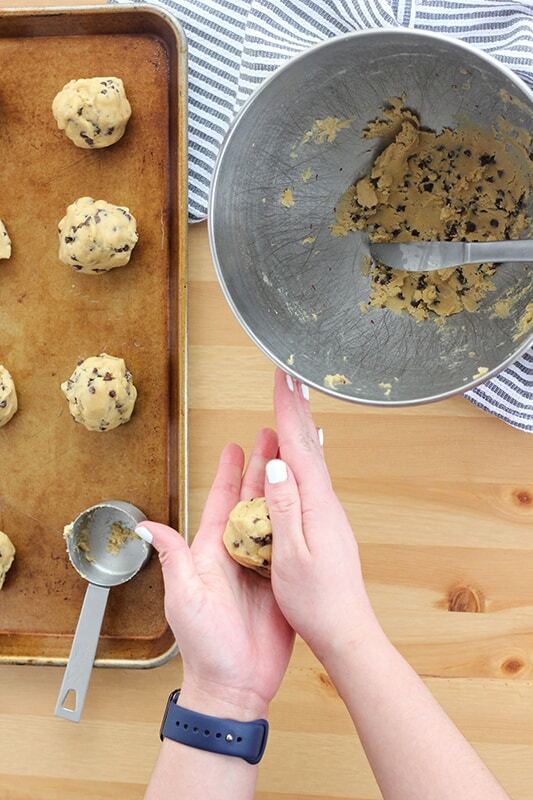 Crisp edges and a chewy center – This is the very BEST Chocolate Chip Cookie Recipe! Easy to make and perfect cookies every single time. This cookie recipe is a labor of love. I have made, remade, and made it again and again. Testing, changing, and adjusting. I wanted to make sure I had the very best cookie recipe that produced the very best chocolate chip cookies. Boy, oh boy, am I happy to share it! This recipe produces thick, chewy, fully cooked cookies that are hard to resist. Given the stamp of approval from my very critical taste testers (neighborhood kids) and loved by my very picky husband. Chocolate chip cookie recipes have always been my nemesis. There are so many out there and so many different varieties. Some are good, some are great, and some are just bad. Finding that perfect one that fits with your tastes is a challenge, but I knew it was one I needed to tackle. First, I met with my team (nine year old and husband) to determine our criteria. What makes a chocolate chip cookie the best? It needed to be a thick and chewy cookie. Our cookie had to be soft but cooked through. They needed to stand up to the milk dipping test. This cookie recipe stands up to all three challenges. 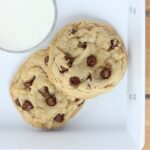 It has a slightly crisp exterior but a light and soft center, can be dunked and submerged in ice cold milk and will stay held together with ease, and it is the cookie recipe to replace all cookie recipes. 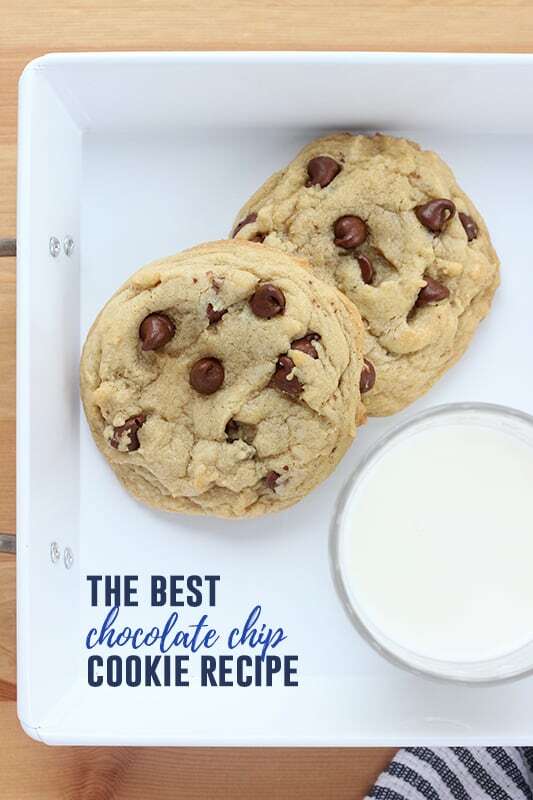 How do I make awesome chocolate chip cookies? So, what is different about these cookies that makes them the best? Let’s chat about the process. What are the ingredients for chocolate chip cookies? It uses half all-purpose flour and half cake flour. Cake flour has less protein than all-purpose which gives your cookie a more delicate texture. No cake flour? No problem! Add 2 tablespoons of cornstarch to a 1 cup measuring cup. Top off with all-purpose flour. This will give you exactly ONE CUP of cake flour. Melted butter. Melting the butter gives you a more chewy cookie. Do not skip this very important step! What kind of chocolate should I use in chocolate chip cookies? I am a BIG believer that the only chocolate fit for cookies is semi sweet chips. That being said, we have also made these with milk chocolate and white chocolate with success! 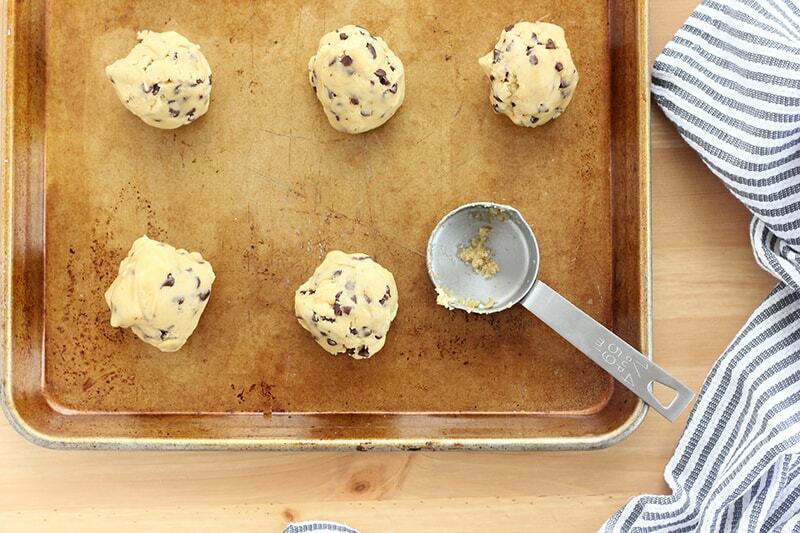 You can use mini chips, chocolate chunks, or regular with the same perfect results. Do I really need to chill my cookie dough? Chilling the cookie dough helps the fat solidify. The chilled dough helps keep the cookies from spreading resulting in a thicker cookie. This recipe make large cookies. 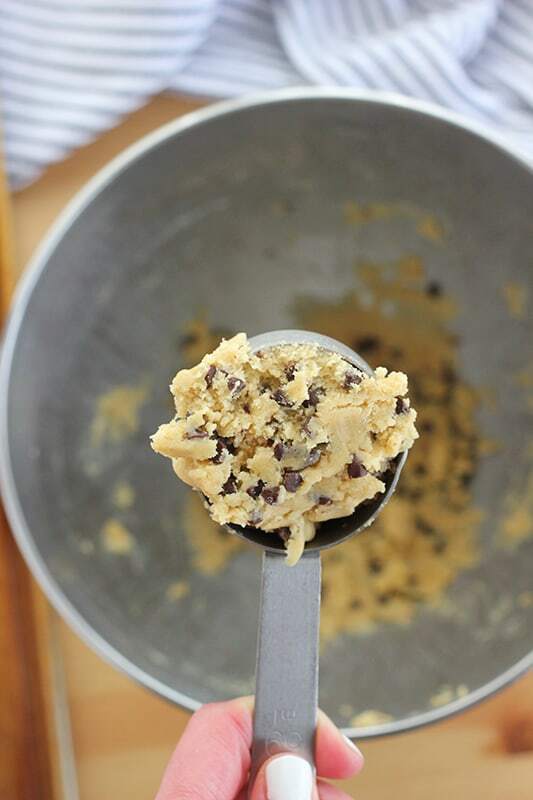 I use a 1/4 cup scoop to get similar sizing which means your cookies will be about the size of your hand. They store well in an air tight container or zip top bag. We haven’t been able to keep them around longer than a few days, but they are very freezer friendly. Roll your dough into rounds and place on a cookie tray. Place in a heavy duty freezer zip top bag that is labeled. When ready to bake, pull them out of the freezer and place on a parchment lined tray. Let them sit for 30 minutes and bake as directed. 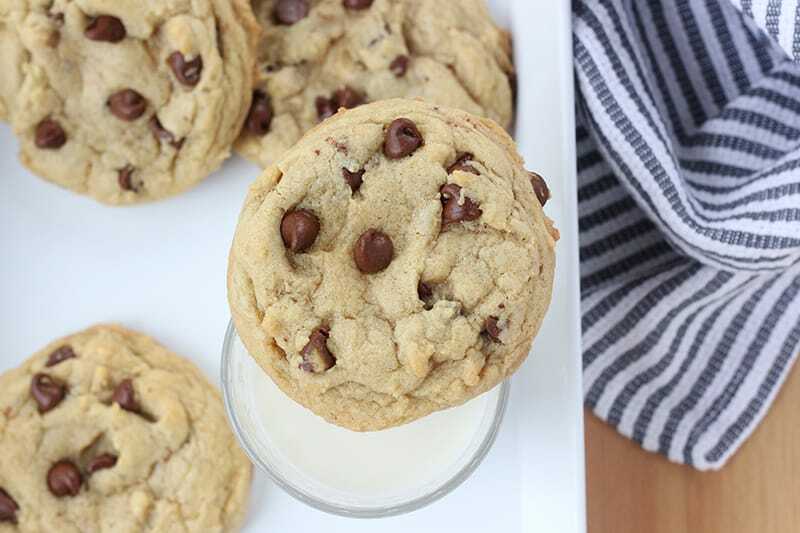 Crisp edges and a chewy center - This is the very BEST Chocolate Chip Cookie Recipe! Easy to make and perfect cookies every single time. Whisk together the flours, baking soda, and salt in a large measuring cup. Set aside. Combine the butter with both of the sugars in the bowl of an electric mixer. Stir with the paddle attachment on low/medium speed until slightly fluffy. Mix in the vanilla extract and eggs, one at a time. Stir on low speed until incorporated. Stir in the dry ingredients until just incorporated. Fold in the chocolate chips. Cover and chill the dough 4 hours or overnight. Preheat the oven to 325 degrees. Line two cookie trays with parchment paper. Scoop 1/4 cups of dough onto your prepared trays keeping them 2-3 inches apart. Bake 15-17 minutes or until the edges are slightly curled and browned and the tops no longer look doughy. Cool completely on the cookie tray (except for the few you need to try warm).